Imagine a life amidst war, another war, and recovery from decades of war, where humans decide that all public positions are shared between women and men, and where, in fact, everything is shared. It’s not a bleak but beautiful fantasy dreamed up by Ursula le Guin, it is here and now on the border between Syria and Turkey. It is Rojava. Compare and contrast with a rich, lush, green and pleasant land that has just voted - whether it fully knows it or not - to abandon equality and human rights and sharing anything with anyone. It is here and now and it is England. Across the Atlantic, in New York, a stalwart seeker after equality and human rights, the feminist writer-activist Meredith Tax, noticed morsels of news about that faraway enclave called Rojava and became excited: could it be? Could it be true that amidst the wreckage of the Middle East something beautiful was being crafted? Two years ago when Daesh attacked Syria’s northern city, Kobane, Tax began to see ‘pictures of smiling rifle-toting girls in uniform defending the city.’ Who were these Kurdish girls?’ she wondered. The same question animated writer Rahila Gupta to write a six-part series on her journey: Witnessing the Revolution in Rojava on openDemocracy (her story will also feature in the book we are co-writing, Why Doesn’t Patriarchy Die?). 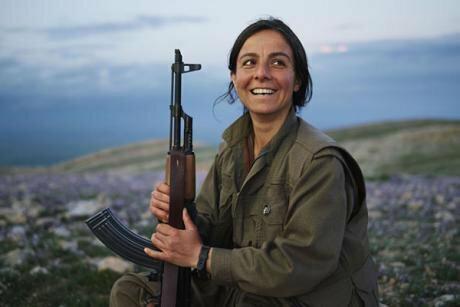 Here in Rojava, she thought, a revolution was being made in our own inhospitable times. How could these women resist the waves of masked jihadis razing towns, fields and cities, wreaking terror? How could they do what no one else, not Iraq’s army, not the Kurds’ fabled Peshmerga, nor Western bombs, had managed to achieve? But they did. However, no sooner had these photogenic heroines appeared than they became invisible. They didn’t disappear, of course, but to western eyes they were out of sight and out of mind. The Obama administration described the Daesh warriors as ‘an imminent threat to every interest we have’ and yet hesitated - with every interest it had - to become the friend of its enemy’s enemy. Something about the Rojava confounded and discombobulated the international players, whose hands and footprints already littered the ruined landscape. Rojava thrilled Meredith Tax, who set about finding out about these women and their mission. 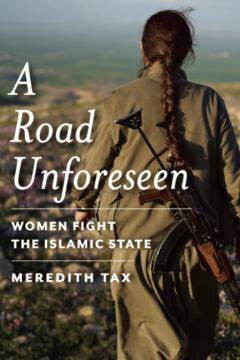 ‘I decided it was my responsibility to tell my friends about Rojava,’ Then she wrote an article for Dissent magazine, then she wrote this book, A Road Unforeseen: Women Fight the Islamic State (Bellevue Literary Press, August 2016). It is the outcome of her swift, intense and forensic inquiry. Her narrative is also informed by the wisdom accumulated during her radical own history: she was a member of one of the founding Women’s Liberation groups of the late 1960s, Bread and Roses - a name branded on the consciousness of activists in the Seventies. She belongs to a generation of activists and intellectuals who made and were made by the black civil rights, feminist and anti-war movements in the US, that confidently quarried revolutionary theory and practise for inspiration. Between then and now this generation has lived with the rise and fall of revolutionary experiments - it knows all about failure. And so she brings the habit ‘optimism of the will and pessimism of the intellect’ to her inquiry. The journey takes her deep to the history of Middle East and the fate of Kurds, sliced up between the post-imperialist divisions of the region, and the interminable repressions of Turkey, Iraq, Iran and Syria. Accommodations were made, tribalisms refreshed, massacres perpetrated, villages evacuated. Crucial was the US and Saudi sponsorship of jihadis across the region and the resistance of Turkey, Iraq and Syria to any possibility of Kurd autonomy. Kurds were confronted by jihad on one flank, state repression on the other. During the 1980s, Saddam Hussein’s regime in Iraq pursued a scorched earth policy against the Kurds - thousands of villages were razed and refugees poured across the borders into Turkey and Iran. Turkey would not tolerate Kurd autonomy. The US didn’t want a fragmented Iraq - though that’s what the invasion in 2003 delivered. After enduring astounding violence, they were only to discover during Iraq’s invasion of Kuwait in 1990 that the Bush administration in Washington did not want to reach out to save them. Tax traces the conjunctures when Kurdish struggles for survival reach out to modern theories of revolution or ancient practises of tribal hierarchy, all the time navigating alliances, seeking spaces of respite where they think afresh. Ironically, it is in the grotesque aftermath of the Iraq invasion that Kurds, in a sense, re-discover themselves. In oil-rich Iraq, Kurdistan is established, malls are built, billions pour in, fortunes are made and squandered, and hope of a new dawn for women dashed. By contrast, the Kurd guerrilla movements based in Syria and Turkey re-think their relationship to their social base. Women are central to that process, both because their activism is grounded in everyday life, in civil society, in relatives’ movements on behalf of prisoners and lost loved ones, and also because gender becomes a decisive term in the intellectual quest to modernise theory in the wake of so many failed revolutions. It would not have emerged in the sequestered and hierarchical guerrilla movements themselves - these highly disciplined fighters were governed by profoundly authoritarian and centralised leadership. But gender equality drives the new thinking of their leader Abdullah Ocalan, whilst imprisoned by Turkey (with the support of the CIA). Incarceration - the fate of so many guerrillas - creates the context, time and space, to read and think. Indeed, Tax’s story is punctuated by conjunctures that make the Kurd guerrillas re-think and re-group. A Road Unforeseen: Women Fight the Islamic State. In prison Ocalan reads and reads - Marxism, anarchism and feminism - and discovers the axis between patriarchy, property and the nation state. Meredith Tax explains how Ocalan in the 1990s brings that critique to the specific experience of stateless Kurds’ experience of tribalism, imperialism and capitalism. The commitment to sharing men power with women, and to a political strategy founded upon equality and environmental sustainability, is, to a degree, imposed on the men and enthusiastically embraced by women who had, by then, developed intimate solidarities in the guerrilla militias, in prison and in organising communities’ besieged survival. Harassed, raided, tortured on all sides, they manage to build something formidable - so poor, but so strong. It was they, above all, who engineered the liberation of the Yazidis from Daesh warriors. Now they are improvising a new model of living in an enclave that is not an ethnic state but a confederation of half a dozen ethnicities, organising co-operative economy in an egalitarian borderland called Rojava. Meredith Tax wonders whether they can survive. But she is inspired. And reading her book, you will be, too.